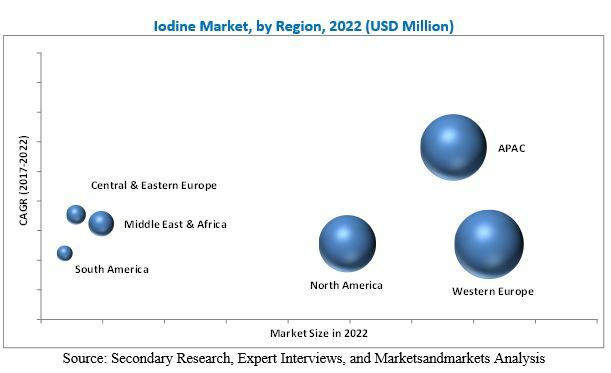 [147 Pages Report] global iodine market is estimated at USD 796.9 Million in 2016 and is projected to reach USD 1,041.0 Million by 2022, at a CAGR of 4.58% between 2017 and 2022. In this study, 2016 has been considered the base year and 2022 as the forecast year to estimate the iodine market size. Note: Core competencies* of the companies are determined in terms of their key developments and key strategies adopted by them to sustain their position in the market. Different secondary sources, such as company websites, encyclopedia, directories, and databases such as Hoovers, Bloomberg, Businessweek, Factiva, and OneSource have been used to identify and collect information useful for this extensive, commercial study of the global iodine market. Primary sources, including experts from related industries, have been interviewed to verify and collect critical information and assess prospects of the market. The top-down approach has been implemented to validate the market size in terms of value. With data triangulation procedures and validation of data through primaries, the exact values of the overall parent market size and individual market sizes have been determined and confirmed in this study. The iodine market has a diversified and established ecosystem of upstream players, such as raw material suppliers, and downstream stakeholders, such as manufacturers, vendors, end users, and government organizations. This study answers several questions for stakeholders, primarily, which market segments they should focus upon during the next two to five years to prioritize their efforts and investments. These stakeholders include iodine manufacturers such as Sociedad Química y Minera (SQM) (Chile), Iofina (UK), ISE Chemicals Corporation (Japan), IOCHEM Corporation (US), Compañía de Salitre y Yodo (Chile), Algorta Norte SA (Chile), Nippoh Chemicals Co., Ltd (Japan), Kanto Natural Gas Development Co., Ltd (Japan), Toho Earthtech Co., Ltd (Japan), and Godo Shigen Co., Ltd (Japan). This research report categorizes the global iodine market based on source, form, application and region, and forecasts revenue growth and provides an analysis of trends in each of the submarkets. Each source is further described in detail in the report with volume forecasts until 2022. Each form is further described in detail in the report with value and volume forecasts until 2022. Each application is further described in detail in the report, with value forecasts until 2022. Each region is further segmented by key countries, such as China, India, Indonesia, Japan, South Korea, the US, Mexico, Canada, Germany, the UK, Italy, France, Turkey, Russia, Saudi Arabia, the UAE, Argentina, Chile, and Brazil. The global iodine market is estimated at USD 832.1 Million in 2017 and is projected to reach USD 1,041.0 Million by 2022, at a CAGR of 4.58% between 2017 and 2022. The market is witnessing growth due to the increasing use of iodine in optical polarizing films in LCD applications. Growing deficiency of iodine in developing countries and use in applications such as X-ray contrast media, fluorinated derivatives, and photography are some of the factors driving the market for iodine. Based on source, caliche ore was the largest source of iodine in 2016. Caliche ores located in Chile are the world’s largest commercially exploited source of natural nitrates and iodine. The extraction of iodine from caliche is economically feasible and effective as compared to other sources, which makes it the largest segment, by source in the iodine market. Based on form, organic compounds was the largest segment of the global iodine market, in 2016. The large market size of the organic compounds segment is because they are used as pesticides and as soil disinfectants in agrochemical industry. Furthermore, organic compounds of iodine are also used as an additive in pet food and cattle feed with high bioavailability. These factors are responsible for making organic compounds the largest segment, by type. X-ray contrast media was the largest application segment of the iodine market in 2016. Diagnostic techniques such X-ray, angiography, CT scan, and gastrointestinal series use contrast media during their execution. The advancements in medical technologies and the growth in nuclear medicinal techniques have bolstered the demand for iodine in this application. Western Europe was the largest market for iodine in 2016. The increasing awareness regarding iodine deficiency coupled with implementation of regulations as stated by global organizations such as WHO and UNICEF to make consumption of iodized salts mandatory is expected to boost the demand for iodine in the region. Furthermore, the increasing expenditures by the government in healthcare sector in Germany and growing number of cancer patients in France are leading to increasing consumption of iodine in X-ray contrast media and pharmaceuticals. Such factors are responsible for the large market share of Western Europe. The global iodine market is witnessing a moderate growth. Factors restraining and challenging the growth of the iodine market are the toxicity associated with consumption of iodine and its derivatives and the fluctuating prices of iodine due to demand-supply gap. Sociedad Química y Minera (Chile), Iofina (UK), ISE Chemicals Corporation (Japan), IOCHEM Corporation (US), Compañía de Salitre y Yodo (Chile), and Algorta Norte SA (Chile) lead the global iodine market. 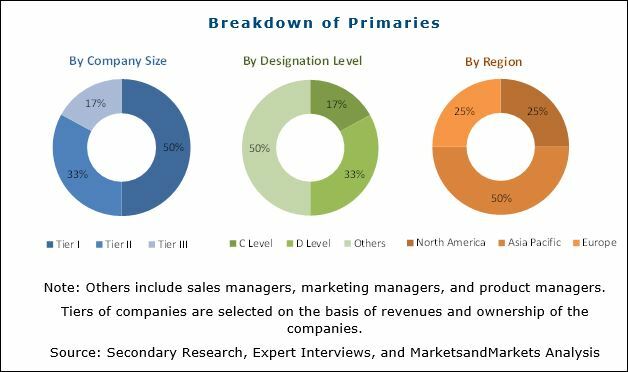 These players are the major manufacturers of iodine and are gaining a strong foothold in the market through their strategies of capacity expansions. 11.6 Cosayach Compañía De Salitre Y Yodo. 11.7 Nippoh Chemicals Co., Ltd.
11.8 Kanto Natural Gas Development Co., Ltd.
11.9 Toho Earthtech Co., Ltd.
11.11.1 Nihon Tennen Gas Co.
11.11.2 Eskay Iodine Pvt. Ltd.
11.11.4 Calibre Chemical Pvt. Ltd.
11.11.8 Qingdao Bright Moon Seaweed Group Co., Ltd.
11.11.10 Glide Chem Pvt. Ltd.
11.11.11 Parad Corporation Pvt. Ltd.
11.11.14 Zen Chemicals Pvt. Ltd.
*Details on Business Overview, Products Offered, Recent Developments, SWOT Analysis, and MnM View Might Not Be Captured in Case of Unlisted Companies.